2 Heat olive oil in large nonstick skillet over medium heat and cook onions, mushrooms and zucchini, stirring occasionally, until vegetables are tender, about 5 minutes. Stir in tofu, beans and 1/4 cup prepared Knorr® Parma Rosa sauce mix; heat through. Remove from heat and stir in cooked quinoa and 3/4 cup cheese. Stuff peppers, pressing lightly to pack. 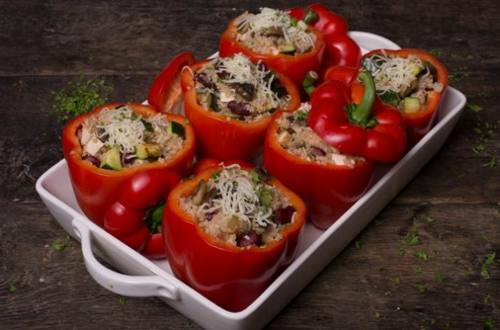 3 Arrange peppers in baking dish, then pour in remaining Sauce. Bake, covered, 45 minutes. Remove cover, top with remaining 1/4 cup cheese and bake until cheese is melted and peppers are tender, about 10 minutes.